The patches that NASA astronaut Jack Swigert wore during the Apollo 13 mission, including this mission insignia, will be auctioned along with other mementos from his estate in May 2014. Apollo 13 mission memorabilia belonging to the late astronaut Jack Swigert is headed for auction 44 years after a last-minute change landed him aboard the ill-fated flight. Swigert, who up until three days before the April 11, 1970 launch had been assigned to the mission's backup crew, replaced command module pilot Thomas "Ken" Mattingly, who was removed from the mission after being exposed to the German measles. The dramatic events that followed, which led to the crew's safe return to Earth, were depicted in the 1995 feature film "Apollo 13," starring Tom Hanks as commander Jim Lovell and Kevin Bacon as Swigert. Now, the mission mementos that the real Swigert kept as souvenirs are being put up for auction by the astronaut's family. Swigert, who did not fly again after Apollo 13, died of cancer in 1982, soon after Colorado elected him to the U.S. House of Representatives. The Los Angeles-based Nate D. Sanders auction house is planning to sell Swigert's artifacts as part of its May online auction. The sale's exact dates are still to be determined. Among Jack Swigert's Apollo 13 flown mementos being auctioned in May 2014 are this command module heat shield plug, mechanical pencil and silver medallion. According to an inventory shared with collectSPACE.com, the auction will include more than 20 lots from the Jack Swigert estate, including mission medallions and patches flown on Apollo 11 and the other U.S. lunar landing missions. The highlight however, may be a collection of four patches that Swigert wore sewn to his spacesuit during the Apollo 13 mission. The emblems, which include the NASA logo, American flag, the mission's insignia, and Swigert's name tag, were silkscreened onto Beta cloth, the same fireproof glass fiber that gave the Apollo-era spacesuits their white color. NASA formally presented the patches to Swigert after his safe return to the Earth. The spacesuit to which they had been previously attached was donated to the Smithsonian National Air and Space Museum in 1973. 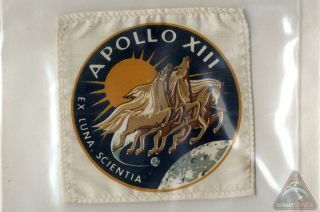 The sale's other Apollo 13 artifacts include a mechanical pencil that Swigert had aboard the flight, a heat shield plug extracted from the command module "Odyssey," a silver medal he carried to space as a souvenir, and a collection of six embroidered mission patches that include a note on congressional stationery attesting that they have "flown to the moon on Apollo 13, April 11-17, 1970." Swigert's official NASA "Astronaut" ID badge as issued by the Johnson Space Center in Houston will also be sold, as will his mustard-colored flight suit and flight jacket that he wore while training for Apollo 13. Nate D. Sanders has yet to set their estimates as to what each of the lots may sell for, though past sales of similar artifacts from other astronauts' collections have resulted in prices ranging from hundreds to hundreds of thousands of dollars. This is believed to be the first time that memorabilia from Swigert's own collection has been sold at auction. Both of Swigert's Apollo 13 crewmembers, Lovell and Fred Haise, have sold some of their mission mementos in years past. A law passed in 2012 confirmed it was legal for the Apollo-era astronauts to keep, and if so desired, sell the mission-used and flown equipment that they retained as souvenirs from their historic spaceflights. Nate D. Sanders has included other space memorabilia as part of previous autograph and collectible sales, including a joystick controller removed from the Apollo 15 command module that sold for $72,556, and a crew-signed American flag flown on the Apollo 11 mission that sold for $63,195 in January. Click through to collectSPACE to view photographs of Apollo 13 astronaut Jack Swigert’s mission memorabilia.